If I had to summarize my thoughts on this book into one word, it would be: clever. I’ve been curious about Everland for a long time but worried that a post-apocalyptic Peter Pan would be weird or cheesy or something. It wasn’t! I loved the way Spinale used elements from the original story in new ways. Remnants of a German army who call themselves Marauders as the pirates in the story. Children who’ve escaped the warfare to live underground and who call themselves Lost Boys. The lack of girls and adults among the survivors explained by the fact that the disease which killed so much of the population targets females and grown-ups. The plot moves quickly, and danger lurks around every turn. Once I started reading this book, I couldn’t stop. If I wasn’t reading, I was thinking about the story and wondering what would happen next! Bella was probably my favorite character. She’s smart and bold and frank. A bit capricious, as you’d expect, but since she’s a twelve-year-old girl, it’s hard to dislike her. I loved the steampunk elements of the story, too. The zeppelins and steam trains and Bella’s metal wings. So many cool details made Everland a sharply memorable book. 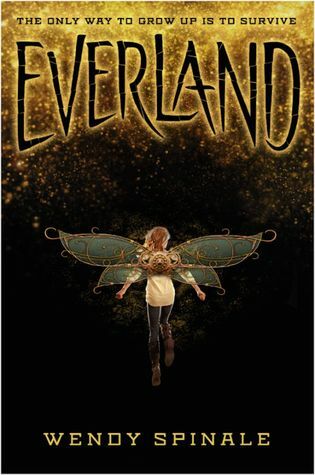 If you liked the Lunar Chronicles (like Cinder) or Spindle Fire by Alexa Hillyer (though Everland is not as dark), you need Everland on your reading list. Main characters are white. Hook is German. Gwen and the others are English. A couple of lines like so-and-so let loose a string of profanity. No actual profanity. Vague reference to the fact that if Gwen is the last girl, she might be in danger of being assaulted. It’s super vague and no real danger happens on that topic. At one point boys snicker a bit about her joining their group and she comments that she doesn’t even want to know what they’re thinking. One brief kiss between a boy and girl. Hook recalls a childhood memory: he offered his mother an apple, not knowing it was poisoned. She retaliates by destroying his eye. He brands a boy with hot metal. Some brief violence in fights involving knives and gunshots. In one scene, a boy gets attacked by crocodiles. It happens quickly, and the crocs drag him away. At one point, a girl cuts off a boy’s hand and throws it to crocodiles. Hook drinks from a bottle of rum. Lost Boys drink what appears to be beer. Tagged Everland, Fairy Tale Retelling, Peter Pan, Scholastic Press, Wendy Spinale. Bookmark the permalink.